Sometimes coming up with a decent idea to write about is like finding a close parking space at Walmart when it's raining. I tapped on the keys for a while this morning and when it became apparent that no ideas were coming my way, I did the only reasonable thing I could think of — I went blackberry picking. I was afraid with the recent hot spell, that all the berries would dry up and shrivel on the vine, but we had a good shower yesterday. When we walked this morning, I saw bushes that were hanging full of berries as big as June bugs. So I left the cursor blinking impatiently on my laptop, and started looking for a good blackberry picking bucket. 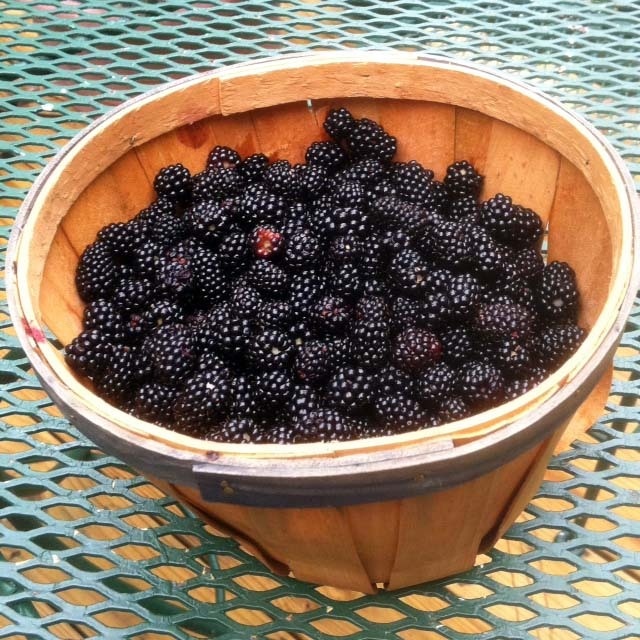 The best buckets for picking berries are gallon lard buckets. When I asked Jilda if we had an empty gallon lard bucket, she spewed coffee out her nose. "Yes, they are over there by the eight-track tapes, " she quipped. A lot of pigs gave their lives so that we could enjoy lard at every meal, when we were kids. I think mama put lard in our tea. You couldn't walk around our yard without tripping over a lard bucket. But today, since we didn't have a lard bucket, I found a small basket and skulked off down toward the barn. Soon I was stomping my way through the bushes and picking berries. Picking blackberries is not for wimps. Getting enough berries for a good blackberry pie is costly. The first thing is the thorns. You are not going to pick blackberries without bloodshed. No matter how careful you are, a limb from a bush will drape over your arm and it is impossible to remove it without sinking a razor sharp thorn into your arm or hand. You can wear long sleeves, long pants, sox, long underwear, and full body armor, but you will still get scratched. Next, there's a very good chance you're going to get chiggers. Some people call them red bugs, but they live in and around blackberry bushes and they love getting in your pants. It's also quite common to feel a tick crawling up your arm or you neck. OK, I know several of you just shivered and involuntarily scratched your neck, but I'm just saying…. You may be asking at this point – why on earth would you go through all of that to get a few berries. Well, it's the blackberry pie. To me, there is no better summertime treat than a hot blackberry pie. The berries have a sweet-tart flavor with tiny seeds that get stuck between your teeth. This is best when you top it off with a scoop of homemade vanilla ice cream. Some would argue that apple, strawberry, or blueberry pies are better, but they don't hold a candle to a blackberry pie in my book. The reason is because most fruits are easy to come by. You stop by Jolly Chollie's produce stand, pick out some fruit, and make a pie. But with blackberries, you have some skin in the game, so to speak. You have scratches on your arms and legs, and chiggers down your britches. So this afternoon, I'll be working in my office when the intoxicating aroma of blackberry pie wafts through the air. My mouth will water because I know that soon I'll be enjoying the fruits of my labor. As a bonus, I now have a topic for my column. I love America. Yay for fruit pies of any kind - especially when freshly picked!! So much fun, reading your post! Nice writing style. 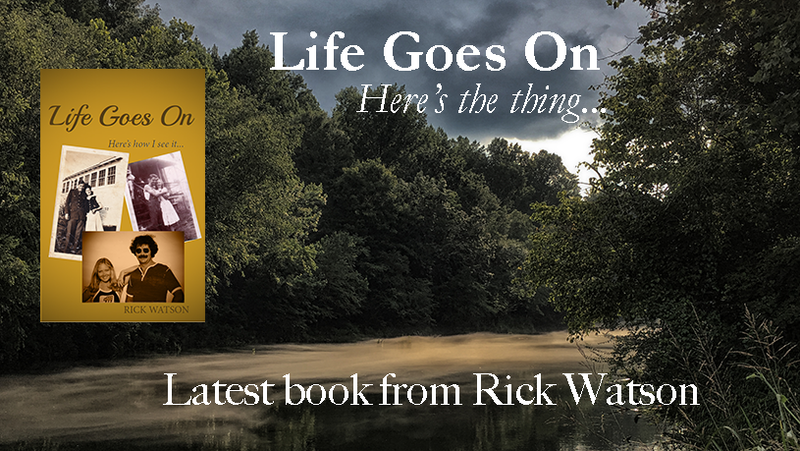 Thanks for stopping by my walking blog (diary of a walker). To answer your query, I'm not sure what the flowers are named. A form of Bird of Paradise, I'm thinking...but more of a vine. It's a South-American beauty, something I found in Placencia, Belize. I hope Jilda is still talking to you after you publicly described her as having spewed coffee out her nose !!! Mmmm . . . nothing better than fresh blackberries. I think you're right -- they taste all the sweeter because of the effort it takes to procure the little buggers. My grandmother always had a lard bucket or two hanging around just for that purpose (as would any good 'Bama raised gal). I used to go huckleberrying as a kid and while not quite as danger filled as blackberry picking usually the only thing that kept me from whining about all the walking and picking and bug bites was the thought of my grandma's homemade raspberry-huckleberry jam spread over a piece of warm homemade bread fresh from the oven. Well now blackberry picking and lard. Two of my favs. Did you know it has now been proven that lard is healthier for you to eat than margerine? See this blog on explanation of why as I am not a dietician, just hoping to learn new/good habits>http://www.wordofwisdomliving.com/ and in his search box type in lard. I used to go blackberry picking in New Orleans years ago with my grandparents and siblings in a section of town we called 'Head for the Hills'. It is now where City Park golf course is. So sad they tore down the bluffs we had there, now I believe Monkey Hill is the highest peak in the Crescent City to climb. Now we find blackberry 'farms' to hunt down the berries. Not as much fun as searching through the countryside but still a good way to enjoy eating the fruits of your endeavor. Ahh life in the South, dang!